I have the best intentions, but often fail at my quiet time with God. 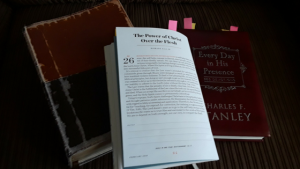 As we ponder the topic of prayer this year, the practice of creating space in our crazy hectic lives for purposeful time with God is a necessary step. In April on this blog, we are looking at the keys of slowing down to spend time with God in stillness, slowness, and quiet time with God. 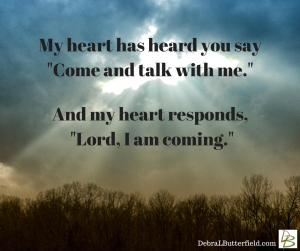 On my Thursday posts, I pick one theme (or person of faith) to explore deeper. I call this series Tending the Holy Thursdays. I am excited to introduce to you a guest blogger today, my friend. Deb Butterfield. I asked her to share some thoughts about quiet time with God. Debra L. Butterfield is the author of Carried by Grace: a Guide for Mothers of Victims of Sexual Abuse, 7 Cheat Sheets to Cut Editing Costs, Abba’s Promise, and Mystery on Maple Hill. She blogs on the craft of writing at DebraLButterfield.com. In conjunction with Abuse Awareness month, she is offering Carried by Grace for $9.95 print or $0.99 Kindle. Welcome to Healthy Spirituality, Deb! Like me, I think King David of the Bible must have been a morning person as is evident in the verse below. As a single, self-employed woman, I have the pleasure of creating my own work schedule. This allows me to spend 1-2 hours in the morning in quiet time with God. I don’t say that to brag, but to make a point. I once mentioned that time frame in a chat with someone, and his reply was that was way too much time to spend with God every day. The moment he said it, I felt the Holy Spirit within me cringe. Would my friend say that same thing about the time he spends with his wife? How would we feel if God said that about us? But not everyone is a morning person. And very few have the freedom of creating their own work schedule. In fact, today’s culture pulls us so many different directions that even thinking about spending time with God pushes you into overwhelm. And though we can pray while showering, during our commute, washing dishes, or during any mundane task that doesn’t require our concentration, this month’s focus is all about slowing down to spend time with God. Not to worry. It’s not about when or how much, but simply that you do. a greater sense of peace? Making our relationship with God the first priority helps everything else fall into order. Try to find a time of day you feel you can meet consistently. The same time each day will help build the habit. Make your environment as distraction free as possible. Ask the Holy Spirit to clear your mind of the day’s troubles and help you focus on God. Have your Bible and perhaps a devotional book. Tell God you want to get to know Him better and ask Him to reveal the truth He has for you today. Read your devotional or a portion of your Bible and think about what it says to you. It’s really that simple and can take as little or as much time as you like. During my quiet time I do a variety of things. Sometimes read books by other people that help me grow in my knowledge of the Bible or in faith. When I committed to having a daily time with God I started with 5-10 minutes each day. My 1-2 hours developed over the years. But now if I oversleep and can’t get in that time, I feel cheated, like I missed out on a special date with God. Bring relief to your stress and find God’s peace (Isaiah 26:3). With all those benefits, how could we not slow down and spend time with God? It’s in our time with God that He gives us guidance for our day (Psalm 37:23, 25:4–5, Proverbs 16:9) to fulfill His plan and purpose for our lives (Jeremiah 29:11). Just as developing a relationship with your spouse, a child, or friend, spending time with them is an essential part of growing that relationship. Spending time with God is the same. Before you know it, when you miss a day, you’ll miss it. Thanks for this great reflection, Deb. I know the more I spend time with God, the more I DO miss his presence when I rush into the day with first starting with the Lord. Don’t forget to download your free updated guide “Slowing Down to be with God” by clicking the button below. Let’s discuss this essential spiritual practice: quiet time with God. What helps you in practicing this discipline? 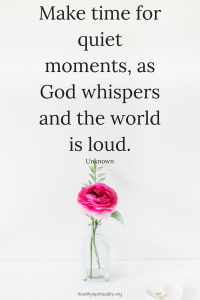 What benefits have you experience in quiet time with God?